Details at the end of this post on how to enter to win a copy of Better Dead, and a link to purchase it from Amazon and an indie bookstore where a portion goes to help support KRL. Holly Davis would have preferred to have been a divorcee instead of a widow, but Burl didn’t give her the chance. Her philandering husband crashed his plane before Holly could throw the official papers and photographic evidence in his face, meaning that Holly was still obliged to put up a Southern-style pretense of mourning. After an obligatory three months, Holly is more than ready to don a red dress and open her family’s antebellum planation Holly Grove as a haunted bed and breakfast. Listed on Haunted Pilgrimage Tour of Homes for Delta Ridge, Louisiana, Holly hopes that the incoming tourists will bring in income to make up for the funds that Burl emptied out of their savings. It seems that Holly will have a very real ghost occupying her B&B though, as Burl has inconveniently dropped back into her life with the announcement that he has until Halloween to make his amends if he hopes to get to heaven. With just thirty days on the clock, Holly doesn’t need the arrival of her high school boyfriend Jake McCann back in her life to complicate both her emotions and her future business. For while she believes that he has arrived back in Delta Ridge to take over for his relative at the Gazette, Jake is actually in town investigating Burl’s drug-smuggling activities for Immigration and Customs Enforcement. Jake has difficulty believing that “Hurricane Holly” had no knowledge of her husband’s operation, or that she still isn’t involved. Even more unimaginable is that the YouTube video showing an actual haunting at Holly Grove is real, due to Burl’s rather abysmal ghosting skills. His antics are drawing in more guests, but the problem is that at least one of them may be a criminal. When a novel starts with the heroine passing out and being restrained by the senior ladies of the Delta Ridge Bridge Club on suspicion of a cocaine overdose, readers know that that they’re in for a romp of a ride. Holly’s housekeeper attempts to bring in a priest to exorcize Burl out of Holly Grove, but it will take more than Holy Water to stop him from continuing to bring chaos into Holly’s life. The romance between Jake and Holly has a sizable roadblock in the form of her spectral husband, but even bigger than that will be the challenge of keeping Holly alive, safe from her possibly criminal guests, and out of jail. Alternating viewpoints from Jake and Holly highlight their attraction for one another, although his investigating her for running a drug ring makes reigniting their relationship a bad idea. Nevertheless, readers should rest assured that the mysteries will be solved, Burl will get his just reward, and that Jake and Holly are in for the time of their lives. Delta Ridge more than delivers its share of eccentric characters, venal criminals, and laugh-out-loud moments. 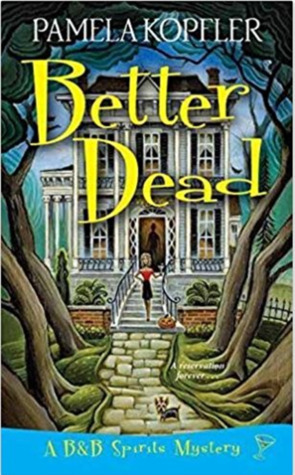 To enter to win a copy of Better Dead, simply email KRL at krlcontests@gmail[dot]com by replacing the [dot] with a period, and with the subject line “better,” or comment on this article. A winner will be chosen February 24, 2018. U.S. residents only. If entering via email please include your mailing address, and if via comment please include your email address. Looks like an entertaining book. Thanks for this opportunity! What a story line. This is definitely a must read on my to be read list. WOW! What an amazing storyline and one I’d very much love to read about. Look at the marvelous cover. Love everything about it from the little pouch in the foreground, the haunting looking trees along the walkway, the gorgeous big house, to the ghost in the doorway. Thank you so much for the chance to win a copy of “Better Dead” By Pamela Kopfler! I can’t wait to read this new series. Sounds like fun. This sounds like a good read. Thanks for the chance to win a copy. Sounds interesting. New author to me, would love to read. Hell’s yeah, I want this one. I think I’ll share it with my SIL also. He’s an NYPD officer. I know he’d get a kick out of it. A recent post from Nora-Adrienne: March is almost here and so are the new book titles! This sounds good! Not familiar with the author, I think this is the first thing I’ve seen by her. Thanks for the chance to win!